Become a member. Get instant access. Watch how-to videos. Attend online monthly advice sessions. You’re seconds away from the essential resources, advice & support you need to start, develop and accelerate kids handwriting skills. Have you just found out your child’s school is going to introduce cursive handwriting? Needing to learn it yourself before you can help your little one to write it? Does your child find handwriting ‘boring’? If only there was a way to make it fun, interesting and educational. Are you trying to be relaxed about how your child is writing BUT you really want them to learn this important skill? You’re not at the point of needing to speak to their teacher. However you do want to support them now rather than leaving it. Your child doesn’t struggle to write, he/she writes freely and expressively just illegibly. You want others to appreciate their fab ideas by being able to read it. Is your child loosing patience with the whole cursive writing thing? It’s the joining of the flicks between the letters that makes it so hard to read. Are you looking for a some advice and resources that will really help improve their handwriting? The type of thing that is easy to download, easy to use and does not come with confusing, conflicting and wrong advice. Then my Get Set Write Club is the answer for you and your child. If any of the questions above felt as if I was talking directly to you it is because I have too many desperate parents post messages asking for advice on sites similarly to Mumsnet and get well meaning but rubbish answers back. That’s what inspired me to create the Get Set Write Club. I was fed up of hearing stories about great parents with fantastic kids feeling handwriting is HARD to do, FRUSTRATING to keep trying and on the verge of GIVING UP. I was also VERY concerned to hear that some parents thought their child would ‘grow’ out of it. This is a myth that just does not happen. Another myth is that we do not need to write any more now that we have keyboards and touch screens. In the UK all exams are still handwritten. Examiners mark off a screen looking at scanned papers meaning your child’s writing needs to be more legible now than ever. The Club has been created to give you the right advice, at the right time. In simple to follow bite-sized chunks. It’s a membership site for parents and kids all about handwriting! It’s packed full of ideas that’ll engage your child. You’ll discover how to teach them to write. You will have practical training and easy to follow resources. Whether your child is just starting to write, wanting to write neater or needs to write faster. It’ll even persuade those children who do not want to try to write! PLUS You’ll never feel alone. Every month there is live training and member Q & A calls to help your child reach their full potential. Show how to form recognisable letters every time. Never let your child feel anxious again. Banish their fear forever. Find solutions for children who struggle to learn handwriting in school. Transform terrible and dreadful handwriting into nicely written words. Fix their hand and wrist pain. No child should have pain when writing. Identify awkward pencil grips and what to do. Discuss pencil styles. Make their handwriting readable to parents, teachers and examiners. Banish your fears that it is too late to make changes to handwriting. What makes the Get Set Write Club different? 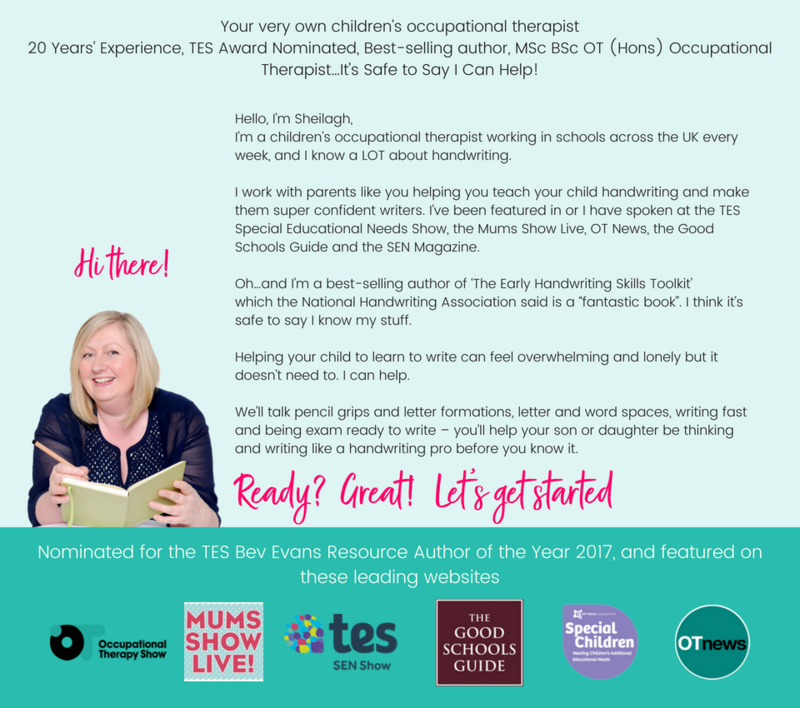 Tap into my 20+ years expertise as an occupational therapist and handwriting expert. Proven track record of helping kids to write. I have written 2 books on handwriting. All my handwriting worksheets are created by myself. They are successful because they use occupational therapy knowledge of hand and child development. Nothing I provide is outdated and ‘old hat’. I use the latest handwriting research. Gaining my knowledge from across the whole world. Teaching cursive & joined up writing is best with special fonts. I ONLY use an award winning font in all of my worksheets. One was specially created for a school in Brighton, UK. Schools employ me to train their teachers on how to teach handwriting. You will be receiving the same information. There are enough handwriting resources for you and your child to do one workbook a week and still have some to spare. Workbooks come with advice on how to use them. All are created by myself using occupational therapy principles. You will pay between £20-40 for a handwriting tutor. My monthly cost is less than what you would pay for 1 lesson. There are over 60 handwriting workbooks for your child to work through. Each one is suitable for kids aged 4 to 16 years. Here is a selection for you to gain an idea at how fantastic they are. Every one has a minimum of 4 pages per book. There are 10 how-to videos that give guidance for each of the 10 Steps to Handwriting Success. Every month I upload new workbooks. These are my monthly challenges meaning your child will never get bored and be asked to repeat the same activities. Receive live expert guidance every month from myself. These are special Q & A sessions that only members of the club gain access to. I'm going to join today and only ever pay the introductory rate, WOOHOO! Not sure if the Get Set Write Club is right for you and your child? The Get Set Write Club is NOT for everyone. This is for the parent who feels that with access to monthly support, a range of handwriting worksheets and a step by step process to follow is right for them. They feel they have the time to work with their child and are looking forward to doing this together. Maybe you feel that you and your child working together may not be the best idea, and sometimes this really is the case. Then my Club may not be right for you. Perhaps we should talk about how I can work together with your child? The Get Set Write Club is for the child whose writing isn’t the best in class. Having said that… there really is no child that it is not suitable for. Your child may enjoy handwriting and want to do more of it. Or you feel they have progressed so far in their writing that a little extra practice will stop them slipping back into bad habits. The club will be right for them too. I suggest ages 4 to 16 years are the most appropriate. I think handwriting practice sheets are fairly rubbish. They don't address any underlying issues, why are yours different? I totally agree, generic handwriting practice sheets are rubbish. They have often been created to look pretty but lack substance. Mine have all been created by myself using Occupational therapy principles of handwriting development. Each one starts simple and gets more complex towards the end of the workbook. The real difference with the handwriting club is that my workbooks are not sold as stand alone products. They come with direction from myself. This is the equivalent of your child having their own handwriting tutor visiting your home, giving them guidance when they need it. I have to introduce a competitive element to get him engaged! Will this help? Yes, I feel that for some children this as a necessity. It helps motivate them. As well as the 10 steps to Handwriting Success™, every month your child will be given new worksheets to complete. They should never get bored with what is on offer. If you yourself like competitions, in the members group I also set challenges for parents. For those that post their child’s work I give away one prize every term to the child who has made the most progress. I am not really quite sure I can do this we have a busy home life already. How much time do I have to commit to this? The ideal thing about the Handwriting Club is that it is self-paced. Meaning that you can pick it up and do a lesson when you and your child are ready. For some they want to get through all of the 10 steps in one go. For others they want to take their time master each step before moving on. It is down to yourself how fast or slow you go. But rest assured I am here to guide you in every step. Every month we will have new worksheets and challenges to complete. You’ll enter a secure checkout page where you will be asked to pay by Paypal and set up a monthly subscription..
Once payment has been made, you will instantly receive a confirmation email giving you access to all my handwriting resources. With this access you can log on at any time you choose 24/7.